If you think of Door County as a place to escape and get some rest and relaxation – you’d be right. But if you think that’s all the area has to offer – you’d be sorely mistaken. In addition to the scenic beaches, charming communities and original artistry, Door County is packed with opportunities for outdoor adventures. It’s also home to some amazing races for runners, bikers and paddlers alike. Take a look at this list of events in Door County letting you test your strength and stamina while enjoying the beauty of the peninsula through the seasons. From grueling triathlons to family-friendly fun runs, there’s an event for athletes of all types. Reading through this list, you’ll no doubt discover something you’d love to try. But if you’re going to make a trip out of it, you’ll want to make sure you plan things out ahead of time. Lodging in Door County can fill up quickly – especially during peak times of the tourism season. An ideal place to stay is the county seat, Sturgeon Bay. That’s where you’ll find bed & breakfasts, cabin and cottage rentals for longer vacations and many hotels and resorts. Plus, nearby Potawatomi State Park has excellent camping. You’ll notice that a lot of these action-packed events take place in and around Sturgeon Bay, so booking a place to stay there might be a smart move. Note: We’ve intentionally left out dates and details for these races that may be subject to change or dependent on the year. Please click the links at the end of each section to visit the official race websites. The Door County Half Marathon takes place inside one of the most gorgeous sites in the entire state – Peninsula State Park in Fish Creek. This race might already be full for 2015, but if it is, just start training for next year! If you enjoy soaking up the beauty of the outdoors while you run, you’ll love this race. The course takes you along the shores of Green Bay in the gorgeous Niagara Escarpment, and you’ll also get a panoramic view of Nicolet Bay. Plus, look for historical markers and other landmarks like the Eagle Bluff Lighthouse and Sven’s Bluff. Apparently, you may run into some pirates along the way too. I have no idea what that means. But organizers say you will by the time you cross the finish line. It may sound strange, but there actually was a pretty infamous Lake Michigan pirate back in the day. Aren’t up for pushing yourself to run 13.1 miles? That’s cool. There’s also the Nicolet Bay 5K, which takes place in Peninsula State Park at the same time. Spring in Wisconsin is brief but beautiful. It can also get pretty muddy, making it the perfect time for an event like Door County’s Dirty 5K. You’ll be doing much more than running in this race. It takes place on the obstacle course at the Team Leadership Center in Sturgeon Bay, also known as the Door County Adventure Center. This mud run takes you through a bunch of messy challenges that include obstacles described as a Cherry Pit, a Marsh Maze and Door County Mud Pies. There are also ropes courses to navigate through and team challenges like rolling huge tractor tires. Plus, some stations will test your brain power with mental mind games too. With more than 20 obstacles in all – this race sounds like a blast. But it might be just as much fun to watch if you’d rather stay clean. Dirty 5K spectators can enjoy a huge discount on admission to the Adventure Center’s zip line course and view the race from above. Perhaps most importantly – Door County’s Dirty 5K supports local victims of domestic violence with proceeds going towards HELP of Door County. The little town of Jacksonport goes big on Memorial Day weekend. That’s when it holds its yearly Maifest celebration. The festivities include a 10K race and a 2-mile fun run that start on Sunday morning at the downtown park. Participants will run along wooded Cave Point Drive and past lovely Clark Lake before circling back to the park. In addition to the races, Jacksonport also hosts a Memorial Day parade and Color Guard ceremony to honor U.S. military members. And you won’t want to miss the huge art fair as well as live music and a classic car show. Early June brings a race for the whole family to Sturgeon Bay. The Hog Wild Run takes place at Martin Park and offers a 10K, a 5K and a Kids Fun Run. Enjoy a scenic course right along the bay’s shoreline as you race through the city’s shipping canal. The Hog Wild Run is part of Sturgeon Bay’s Side Pork Fest, which is good, because you’re going to work up an appetite. Runners and spectators can enjoy mouthwatering grilled pork along with many entertaining activities in the park. This food festival holds a few world records including Most Side Pork Cooked in One Day and Most Side Pork Eaten in One Day. Now who wouldn’t want to help out with that? There’s even a gigantic Kids Zone with activities like trampolines, rock climbing and paintball. The festival also supports local charities. Believe it or not, this is Door County’s first and apparently its only trail run. The race gets its name from the Crossroads at Big Creek Environmental Learning Center, which hosts the event. You can choose to participate in a 5K or a 10K, which are timed races, and there’s also a 2K fun run/walk. The 10K takes runners off the main trails and into a new trail system on the Ida Bay Preserve. This private trail system was donated to Crossroads at Big Creek in 2014. You’ll get to race through beautiful wooded areas and old fruit orchards, run over wooden bridges and cross Big Creek. There’s nothing like running out in nature! The preserve uses this event to educate people on environmental awareness and green living. And they lead by example. All the food is locally-made and grown. Food waste is composted. All paper products are bio-degradable, and water bottles are used in place of paper cups in the race. In addition to t-shirts, coffee mugs and other items participants receive, every runner that finishes the race will also get a potted evergreen donated by Evergreen Nursery. Formerly known as the Ride for Nature, this bicycle race has been a Father’s Day weekend tradition in Door County for more than 25 years. The Peninsula Pacers took over organization of the ride in 2010 and renamed the race the Peninsula Century Spring Classic. It still supports the Ridges Wildlife Sanctuary near Baileys Harbor. This bicycle ride is aptly named as there is a 100 mile course. However, you can also choose to participate in a 62-Mile (metric century) ride, a 50 mile, a 25-mile or the Family Ride that is just 15 miles. If you usually travel along the main state highways 42 and 57 when visiting Door County, this is a great opportunity to explore what’s in the middle of the peninsula. The ride starts at the Baileys Harbor Town Hall and then winds through the backroads for miles and miles of bucolic countryside. Enjoy a post-ride meal, drink ticket and live music after you cross the finish line. In 2015, the race is being held on the same day as the Door County Beer Festival, which the Peninsula Pacers also help organize. If you’ve never experienced Door County over the 4th of July, you’re missing out. It is never more full of activity and celebrations than during that summer holiday. In Fish Creek, they’ve created a 5K run that let’s you take part in a race in the morning and still have time to enjoy 4th of July Festivities all day long. The Hairpin Run starts at 8am on July 4th and gets its name from a super-tight curve in the middle of the race. The course takes runners along Cottage Row for a charming view of Lake Michigan’s bay side. Proceeds from this event support special K-12 programs at Gibraltar Schools. Stick around for the 4th of July fireworks show in Fish Creek. There are celebrations all over Door County – including a big 4th of July party in Sturgeon Bay! Feet and wheels aren’t the only ways to race in Door County. You can also paddle your way around Washington Island in a kayak during this three-day event. Really want to have an adventure? Death’s Door Paddlefest is the place for you! It typically takes place around mid-July and involves three different courses for those who love outdoor adventure sports. There is a half marathon called the Death’s Door Downwind Race. This is a 13 mile kayak course that is designed to put the wind at your back. Paddlers begin at Gislason Beach and make their way along either the east or west side of the island all the way to Washington Harbor’s Schoolhouse Beach. The course will be determined on race-day based on wind and weather conditions. Then there is also a triathlon with a 4-mile kayak race, a 9-mile bicycling portion and a 4.5-mile foot race. Each phase of the race will begin and end at Gislason Beach. Finally, if you’re in it more for an experience than competition, you can participate in the Crossing Death’s Door expedition. This journey takes you right through the passageway between Washington Island and the northern tip of the Door Peninsula. You can travel by kayak or canoe. French explorers gave that area the name “Porte des Morts,” the “door of death,” because of all the shipwrecks that happened there. Plus, there are many stories of Native American warriors who lost their lives in the wind and waves of that dangerous passageway. Safety will be a priority for this expedition, however. You’ll be with a group of expert kayakers and canoers, and the Washington Island Ferry will help provide transportation. Never kayaked before? You can learn all about it at Everyone Paddles – the Door County Sea Kayak Symposium. It’s a separate event, which takes place about the same time in 2015. The two-day symposium is held at Rowleys Bay Resort. Everyone Paddles is designed to be a family-friendly experience for kayakers of all skill levels. There will be classes and kayak tours as well as chances to check out shipwrecks, lighthouses and more! This triathlon is for the true extreme athletes! The 2015 Door County Triathlon takes place in mid-July. However, the main race sold out less than 24-hours after registration opened. But look on the bright side. You’ve got time to train for next year! Judging by the video below – this could also be an amazing event to watch. Around 1,000 hard-core athletes will swim, bike and run as they take on the chilly waters of Lake Michigan and terrain of Door County. The Door County Triathlon hosts a Half Iron as well as a shorter Sprint triathlon and a Kids triathlon too. The Half Iron includes a 1.2 mile swim in Horseshoe Bay. Then there is a 56+ mile bike ride through backroads and into Sturgeon Bay’s shipping district. The triathlon finishes with a half marathon that takes runners through Egg Harbor where there is a challenging 200 foot hill, and finally a downhill descent leads to the finish line. My heart almost exploded just thinking about all that! In September, this run in Sturgeon Bay is held to remember the lives lost in the 2001 9-11 Attacks. Of course, many of the lives were those of police and firefighters. And in the years that have passed since the terror attacks, thousands of U.S. military members have also given their lives for our country. That’s why the 9-11 Memorial Run in Sturgeon Bay supports the Sturgeon Bay Honor Guard – a group that brings attention to the sacrifices of veterans and public service members. The run supports other local non-profits too. There is a 10K, 5K and a 2.5K run/walk for families. All races start in front of Sturgeon Bay city hall and take you over the Michigan St. bridge. For a patriotic ending, the finish line includes a giant American flag. 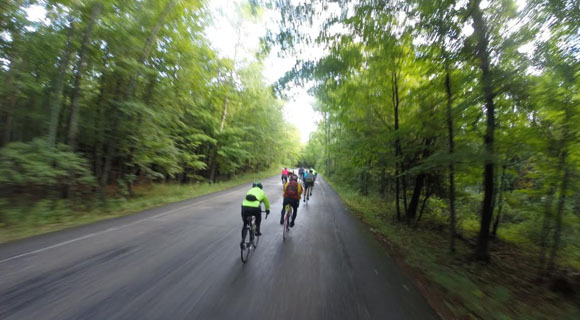 The Door County Century Bike Ride is your opportunity to get some fresh autumn air while seeing the amazing fall colors in Door County. This event not only includes a century ride, there is also an action-packed, super-entertaining cyclocross event. 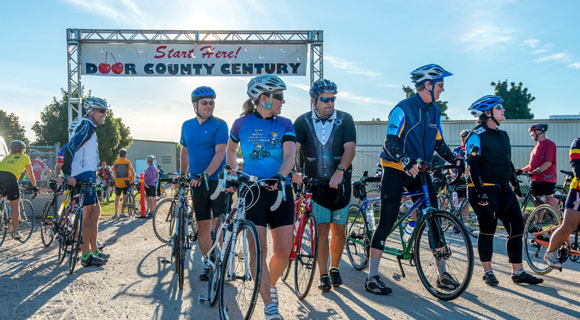 The Door County Century Ride has been going on since 1979. It starts and finishes at the Door County Fairgrounds in Sturgeon Bay. During the 100 miles in between, you’ll essentially ride around the perimeter of the peninsula. This is not a competitive race, as the more than 3,000 participating bicyclists are encouraged to ride at their own pace. In addition to the 100-mile ride, there are also 28.5, 50 and 70-mile courses. There will also be a Fatbike Race at the end of the event. While the cyclocross will be competitive and include prize money, the focus is still on the experience and having fun. Riders are encouraged to wear a costume. Plus, second and third place winners get a chance to soak the first place winners in a dunk tank. Want even more bicycling in Door County? You got it. The Peninsula Century Fall Challenge is organized by the Peninsula Pacers, the same folks who put together the Spring Challenge (Ride for Nature), the Door County Half Marathon and the Nicolet Bay 5K. Just like the spring version, in this late-September race there are 25-mile, 50-mile, 62-mile and 100-mile courses. Expect to climb some challenging hills on this northern Door County ride that starts and ends at Waterfront Park in Sister Bay. If you’re riding the 100-mile route, you can also participate in the King of the Hill Challenge. Using an app called Strava, you are timed while biking up three different hills. Organizers have named those hills Peninsula Panic, Monument Mayhem and Lakeview Linger. One king and one queen will be crowned and win special prizes for being the fastest. When you finish your race, there will be a meal and live music waiting for you. Plus, stick around to take in the Sister Bay sunset. The fun continues into the fall when Potawatomi State Park in Sturgeon Bay hosts a quarter marathon, a 5K run and 1/3-mile Smokey Bear Run for the little racers. Kids might even get the chance to meet Smokey himself! The non-profit, volunteer group Friends of Potawatomi State Park organizes the Run Wild event as a fundraiser for the park every year in October. It all takes place inside the park grounds. See the limestone cliffs, run through the falling autumn leaves as they crunch underneath your shoes and check out the park’s observation tower. You’ll be helping volunteers keep this park beautiful. If you consider yourself an “ultra marathon runner” this 50-mile challenge in late October will be right up your alley. You can also participate in the Door County Fall 50 as a relay – with a team of up to five runners each taking on a 10-mile leg of the course. Unfortunately, spots for the relay have already filled up for 2015. This run bills itself as “the most scenic distance run in the Midwest.” And that’s hard to deny when you take a look at the course. The Door County Fall 50 starts at the top of the peninsula by the Shoreline Restaurant in Gills Rock. A variety of legs along the course take you down the western shoreline through communities like Sister Bay, Fish Creek and Egg Harbor, along backroads and passed local parks. It all ends with a big party at Sunset Park in Sturgeon Bay. Apparently, this particular crowd of runners can get pretty rowdy – even after running 50 miles! In 2015, the Door County Fall 50 will also serve as host of the USA Track & Field 50-mile Road Championship for the second year in a row. For those of you who live in Northeast Wisconsin, or who plan to register for several races, the Door County Silent Sports Alliance organizes a special race circuit called Run the Door. You’ll earn points for each race your finish as well as bonus points for placing in the top three or serving as one of the circuit race directors or on a circuit race committee. A kickoff fun run for Run the Door takes place in April, but you have until the beginning of July to sign up. New in 2015, Run the Door has a special division for people who live outside Door County. This article is brought to you by the Sturgeon Bay Visitors Center – committed to promoting the many experiences Sturgeon bay has to offer. Visit sturgeonbay.net and follow Sturgeon Bay Door County on Facebook for more.